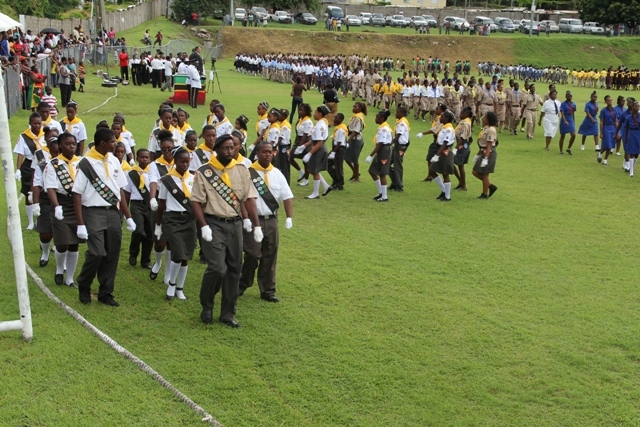 NIA-CHARLESTOWN, NEVIS (September 19TH, 2011) — Scores of Nevisians, this morning [Sept. 19], demonstrated true patriotism when they assembled at the Elquemedo T. Willett Park for the Federation of St. Christopher and Nevis’ 28th anniversary of Independence Ceremonial Parade and Awards Ceremony. Armed and unarmed bodies, including primary and secondary schools, were thunderously applauded as they paraded pass the players’ pavilion, which housed the island’s dignitaries including Deputy Governor General His Honour Mr. Eustace John, President of the Nevis Island Assembly Mrs. Christine Springette, Premier of Nevis the Honourable Joseph Parry and Magistrate Her Worship Ms. Yasmine Clarke. 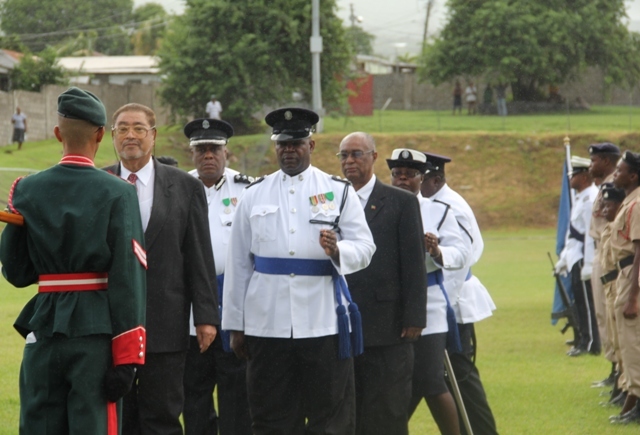 The annual ceremony was punctuated with a well-received address by Premier Parry which was delivered moments after the presentation of awards, to 15 persons, by Deputy Governor General John. Although absent, local businessman Mr. Andy Liburd was applauded as this year’s single recipient of the Business award. He was followed closely by Ms. Violet Lake who received an award for years of commendable community service. Two well-known educators, Mr. Joseph Wiltshire and Mrs. Sonita Daniel, received the Education and Education and Library Services awards respectively while entrepreneurs Mr. Trevor Cornelius and Mr. Emeale Liburd were honoured in the Industry category. As the Nevis Island Administration [NIA] continues to place strong emphasis on the development of Agriculture, Mr. Arville Cornelius was honoured for his contribution to fishing. With a similar emphasis, by the NIA, on the development of tourism, taxi operators Mrs. Cavelle Jeffers and Ms. Hilarena Liburd received the Taxi Service awards. Legal Advisor to the NIA, Mr. Herman Liburd, was the single recipient of the Law award while the late Mr. Earl Hanley received an award for his contribution in the area of music. Manager of The Nevis Bakery Mrs. Lorette Brand-Willett accepted the Trade and Industry award, on behalf of her father, the late Mr. Hubert Brand, while Ms. Deloris Clarke received an award in the Small Business category. The final two awards, in the Postal Service category, went to Mr. Reuben Williams and Mr. Evan Jeffers. The grand event commenced at 8:00am and culminated with the final salute at approximately 9:15am. Also present at this morning’s ceremonial parade and awards ceremony were Deputy Premier the Honourable Hensley Daniel, the Honourable E. Robelto Hector, the Honourable Dwight Cozier, Permanent Secretaries Mr. Alsted Pemberton and Ms. Angelica Elliott and Advisors Mrs. Patricia Hanley, Mr. Dwight Morton and Mr. Llewellyn Parris.